Have you seen the March issue of LA Yoga Magazine yet? 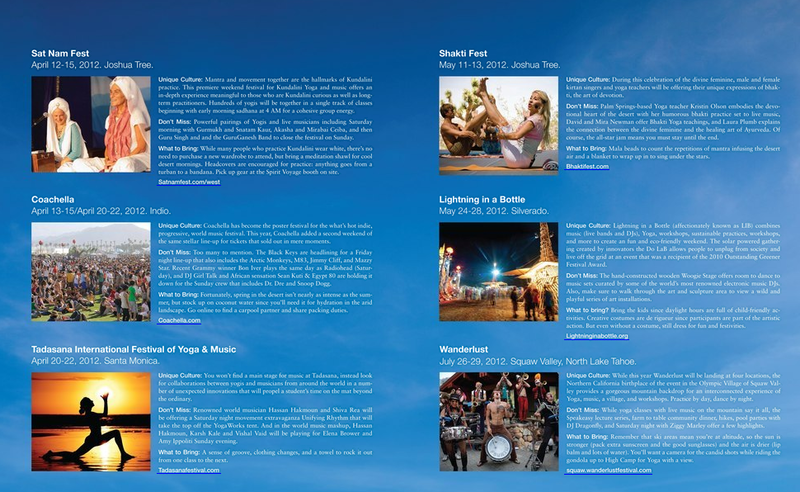 In their spread on yoga festivals around the country, Sat Nam Fest West is squarely featured alongside renowned yoga festivals like Wanderlust and Tadasana. The Sat Nam Fest description gives readers a little taste of what’s to come, and would make a great conversation piece when talking to your friends about why they should join you! The “single track of classes beginning with early morning Sadhana at 4AM” is one of the great things about Sat Nam Fest. At other festivals, there are so many things going on at the same time it can be hard to relax and enjoy what you’re doing (especially when you can hear sound from the other activities bleeding into your own!). The single track at Sat Nam Fest allows you to fully devote yourself to what is happening, and to share in the group energy that builds over the course of the weekend. Another great point about Sat Nam Fest are the “powerful pairings of Yogis and live musicians,” which take place throughout the weekend. 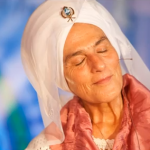 If you’ve seen Snatam Kaur and Gurmukh’s dvd Kundalini Yoga: Healthy Body Fearless Spirit, you know how amazing these collaborations can be. “Mantra and movement together are the hallmarks of Kundalini practice” and you’ll have a chance to hear your favorite musicians providing live music for yoga classes all weekend long. For those less familiar with Kundalini yoga, LA Yoga Magazine dispels the notion that people without fresh, white clothing will be turned away. They do recommend a headcover of some sort, which they note can be acquired at the Spirit Voyage booth (along with many other goodies!). The statement that Sat Nam Fest “offers an in-depth experience meaningful to those who are Kundalini curious as well as long-term practitioners” is spot on. To anyone who feels nervous at the thought of hundreds of yogis in a sea of white, bright eyed and smiling at 4:30 in the morning, don’t worry. Sat Nam Fest will be a great experience for everyone who attends!